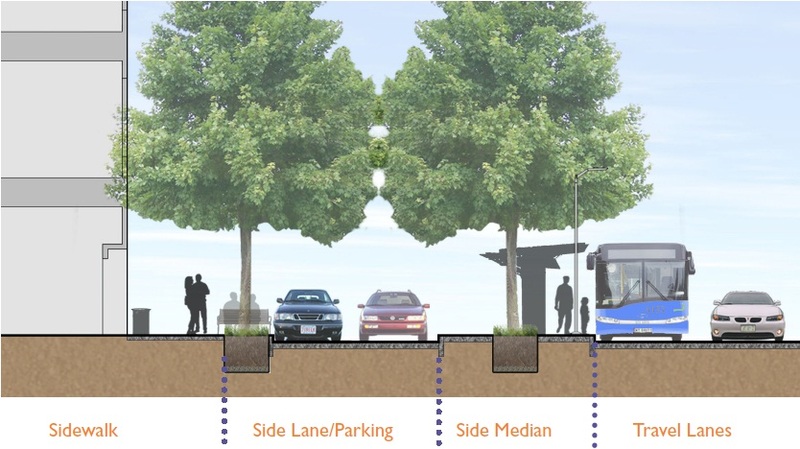 The New Ave Feasibility Study project page has been updated with content from the final report. Check it out! 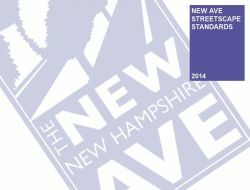 The New Hampshire Avenue Streetscape Standards will set the look, tone, and feel of our community, and change how people walk, bike, get to the bus, and do their shopping on the New Ave. Welcome to the New Ave! The streetscape standards were adopted by Takoma Park City Council on October 15, 2012. The Standards were created with community input from two public meetings, and in coordination with officials from Maryland State Highway Administration, and planners from Montgomery and Prince George's Counties. The Standards outline details such as street furniture styles (e.g. benches, waste receptacles, bike racks, etc. 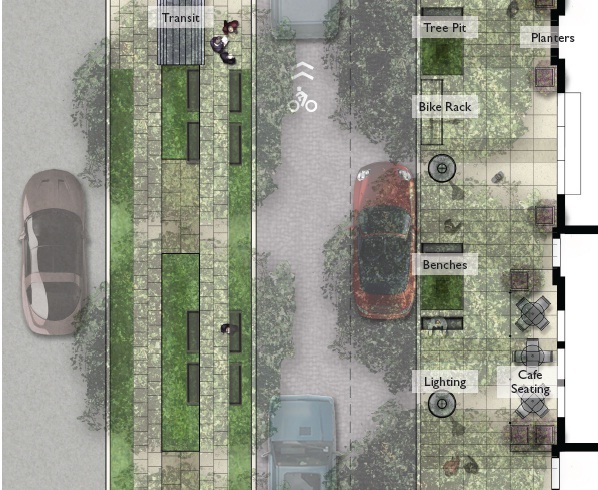 ), street tree species, stormwater infiltration strategies, crosswalk treatments, and pavement types to build identity into the street and our community's front door. Planning staff presented the New Ave Streetscape Standards to Takoma Park City Council. Planning staff and design consultants from Ayers Saint Gross held the second meeting on the New Ave Streetscape Standards project at the Takoma Park Community Center. At the well-attended event, residents from the New Hampshire Avenue corridor weighed in on future streetscape components being developed for their neigborhoods. 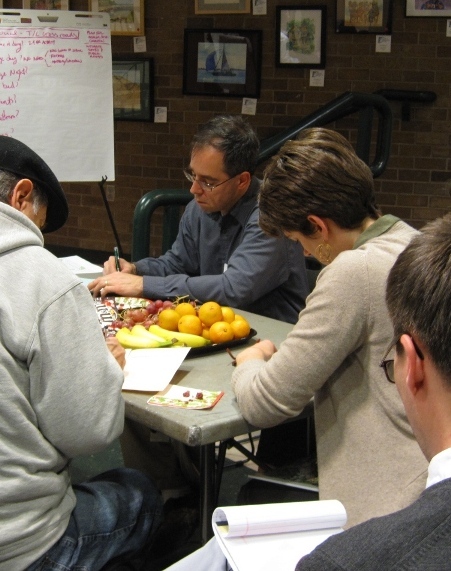 "Nothing elsewhere in Montgomery County is a model for what would feel right and thrive here." "I love the quirky, colorful seating at the bus stop. I would love to see that fun spirit infuse the full plan." The City's New Hampshire Avenue Corridor (MD 650) initiative boundary is from the Takoma Langley Crossroads to Eastern Avenue at the District of Columbia Line. 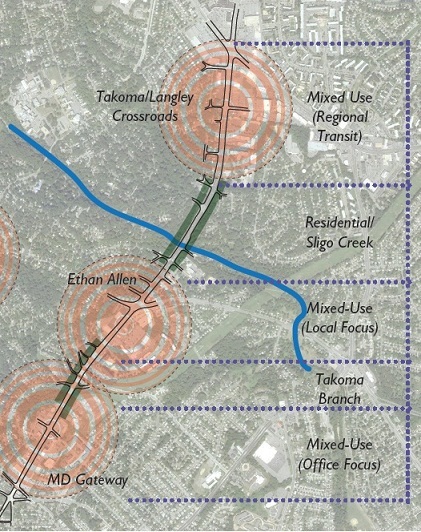 Three activity 'nodes' are recognized along the corridor; Maryland Gateway in the south, Ethan Allen Gateway at East-West Highway, and Takoma/Langley Crossroads at University Blvd. The distinct identities of these three nodes, and the stretches between them, may be represented through differences in streetscape component styles. 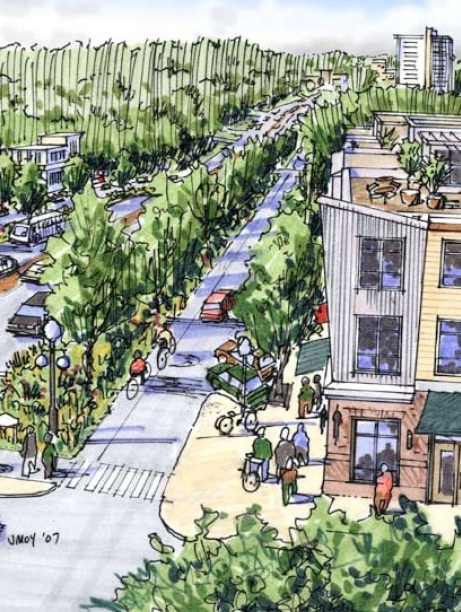 The City has received Transportation Land Use Technical Assistance from the Metropolitan Washington Council of Governments for the development of the New Ave Streetscape Standards. The standards will create quality pedestrian and transit access facilities and include stormwater infiltration details. The project goal is to develop a set of standards that can be used to help guide future development on New Hampshire Avenue to ensure a consistent look and feel on the corridor that meets the City's sustainability goals while reflecting the diversity of the community through design. It is the next layer of detail that further clarifies the objectives and recommendations laid out in the Concept Plan, bringing the New Hampshire Avenue Multiway Boulevard closer to implementation.